Naked cakes are so hot right now! 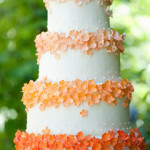 We’re being asked right and left to do little ones, tall ones, cake trios of different flavors, and all kinds of decor. This naked cake was done for Saudia and Brett and dressed in seasonal fruit available at our local specialty fruit source (pssst, it’s the fruit guy at the DTLA flower mart). I love fruit of all different sizes and colors, so we picked up some red crabapple-type apples that had lovely green swaths across the sides that were shaded during growth. Small fruit on a vine looks great and in the absence of champagne grapes (my favorite, but only available in August or so), we used fresh pink peppercorns and their leaves. The bride wanted a pop of orange on there too, and since kumquats were the right size but sadly, out of season, we sculpted a few out of marzipan and popped some of the leaves from the pink peppercorns into the tops. 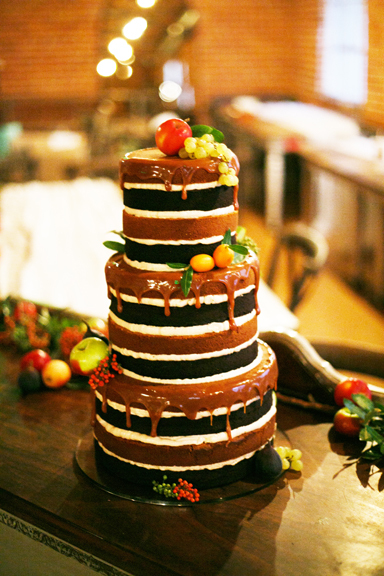 You may see a lot of naked cakes with this caramel drip effect, but many look well, sloppy. Really watery, runny caramel is sometimes used and doesn’t look appetizing. Plus it pools at the base of the tiers. Ick! We ran four viscosity tests for this caramel and found that the Fleur de Sel caramel we make by hand did the trick. Put in a piping bag and heated to the right temp, it easily dripped and stopped to be picture perfect on the final cake. You might also note this naked cake has alternating colors on the sides — this is our Tuxedo flavor, which features layers of chocolate and vanilla cake in each tier, filled with our Fleur de Sel buttercream on the top and bottom and *pure* caramel at the center layer on each tier. What’s that? You can’t see it? That’s true! It’s because we fill the cakes then mask the edges with white buttercream to make the cake look perfect on the exterior. This lovely naked cake to the right was shot inside the amazing Vibiana in Downtown Los Angeles for the internationally known Beth Helmstetter Events. She requested a cake with berries and powdered sugar in a very rustic style for a Romeo and Juliet styled shoot. Berries and powdered sugar is a little trickier than your average naked cake decor. Most decor like fruit with skins or flowers can be secured to the cake with toothpicks or floral wire. Berries, however, are full of juice. If you poke them with anything, they’re going to juice all over the cake and stain the crumb (the part of the cake that shows) taking it beyond rustic to messy. So how do you use them? On a table other than the final placement table, we opened a big towel and set the cake on that. We piled the berries on, and with a big sifter, sifted powdered sugar gently over the top. The sides didn’t get any sugar, just the tops of the tiers, so to take it a little more rustic, Beth asked us to pop a little sugar onto the sides in spots. After that we verrrrry carefully lifted and carried the cake into its final position. A berry or two rolled, leaving a powdered sugar shadow, but we just replaced them and it looked great. If you’d like to see this whole shoot, it was published on Style Me Pretty here. A little behind-the-scenes note: This is a real lemon cake filled with raspberry puree icing. I didn’t want it to go to waste after the shoot, so I donated it to our local firefighters, the brave (and might I add, beautiful) gents at Fire Station 88. Last but not least, we have this full champagne cake filled with strawberry puree buttercream. Champagne and strawberries — what’s more romantic than that?! This naked cake was done for Stacey and Rene, and set as a charming centerpiece to two long tables set under strings of bistro lights at the Ebell of Los Angeles. It’s set on a sweet rustic tree slice about five inches high (many available on Etsy, but make sure they’re LEVEL and cut clean!). Masters of rustic floral design, Holly Flora, worked their magic and decorated the cake with rings of olive twigs and a few flowers here and there. Securing long twigs and flowers like this can be tricky on a cake — twigs don’t want to bend and sometimes larger flowers don’t fit on the tier edges securely. To affix them to the sides, get a four- or five-inch length of dark green floral wire and bend it in a hairpin shape. Insert it through the face of a flower or over a branch, so that when the kitchen is removing the florals for cutting and service, the wires come off with the twigs and flowers. No one wants to eat wire! So make sure you use as little as possible. If you can, hang out in the kitchen while they do this and help clean the cake. Here are more pix and angles of the naked cakes above. Stay tuned for the addition of our Naked Cake Video Tutorial, to be inserted on this post and uploaded to YouTube in mid-May!